All highly saturated in the inevitable exploding visuals as curated by Ken Weston. 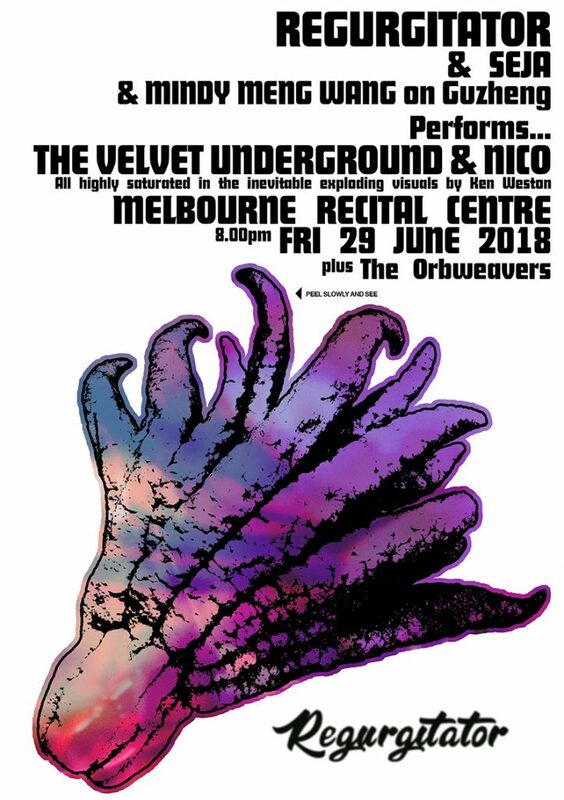 Brisbane art-rock veteran Regurgitator may not be the first act to come to mind when picking teams for a Velvet Underground and Nico tribute. But the group has never met a musical genre it couldn’t lovingly poke a few holes in, or a tongue-in-cheek performance-art stunt it wouldn’t try. Originally conceived to close the National Gallery of Victoria’s Andy Warhol-Ai Weiwei exhibition in 2016, the show returns for an intimate Melbourne Recital Centre performance – with Regurgitator members Quan, Ben and Peter joined by Seja Vogel on keys and Mindy Meng Wang on the Chinese guzheng. Regurgitator navigates its way through the Warhol-produced 1967 album, The Velvet Underground & Nico, which they have successfully performed at the Sydney, Brisbane Festival and MONA FOMA in addition to the NGV premiere. Last year marked the 50-year anniversary of this seminal album release. What better way to celebrate than hearing one of Australia’s most iconic indie music groups reimagine the influential album which fused together pop melodies and avant-garde sounds. Experience a faithful but fresh reinvention of one of the greatest albums of all time – a love letter from one set of enduring eccentrics to another.